FREE Lynda.com Subscription for CPCC Students and Employees! Wow! 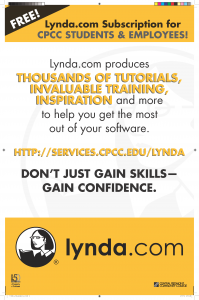 Did you know that CPCC students and employees now have FREE access to Lynda.com’s collection of online tutorials and training? Lynda.com produces thousands of tutorials, invaluable training, inspiration and more to help you get the most out of your software. Don’t just gain skills—gain confidence. To get started, visit http://services.cpcc.edu/lynda. You will need to provide your CPCC login to access the site. If you have any issues or questions, please contact the CPCC ITS Help Desk.